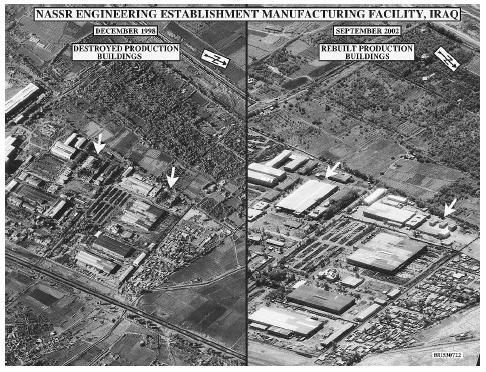 Department of Defense photo showing the Nassr Engineering Manufacturing facility in Iraq destroyed in 1998, and rebuilt in 2002. Analysts at the Defense Department determined that the rebuilt facility had the capability to produce precision components for nuclear missiles. U.S. Department of Defense. < http://www.defenselink.mil/ > (April 28, 2003).